Author: Hall, James W. Set In . . . Passion and intrigue heat up the Florida Keys as Thorn and Alexandra Rafferty--returning from Blackwater Sound---face down a brutal killer who has kidnapped the daughter of Thorn's best friend. Before Alexandra came into Thorn's live, there had been Anne Joy, a beautiful woman who, after escaping the violence of her past, found something like happiness in the languid life of the Florida Keys. And her past includes her sadistic brother Vic, now a wealthy rogue businessman who specializes in the hijacking of pleasure boats and who delights in cruelly murdering their owners. Vic is obsessed by his sister and will do whatever it takes to drive her lovers away---even murder. When Vic decides that he must possess the land on which Thorn's beloved home is built, nothing will stand in his way---not even the life of a little girl, the daughter of Thorn's closest friend. 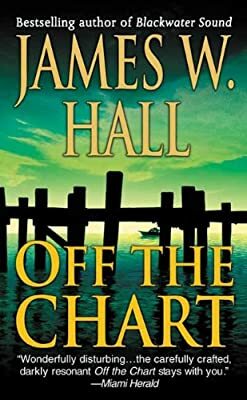 From the lushness of the Florida Keys to a nightmare climax on the tropical coast of Central America, Off the Chart is vintage Hall.